From left, Drs. Juan E. Gilbert, Jerlando F.L. 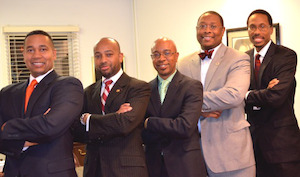 Jackson, Chance W. Lewis, James L. Moore III and Lamont A. Flowers started bonding years ago at “tea time,” their informal gatherings where they encouraged each other as they navigated through graduate school. On a snowy December evening, Drs. Lamont A. Flowers, Juan E. Gilbert, Jerlando F.L. Jackson, Chance W. Lewis and James L. Moore III were sipping tea at an Italian restaurant a few miles south of the U.S.’s capital, recalling the first time that they met. For these five Black academicians, who burst onto the national scene with their scholarship focused on the myriad of issues that impact education, the frequent fraternal gatherings have undoubtedly helped to propel their rise. “Tea time,” as they call it, first started off as an informal opportunity for these “brothers” to encourage each other as they navigated their way through graduate school and secured their first teaching jobs as assistant professors. But now, as full professors with endowed chairs and all the benefits that come with such positions, they have yet to cease meeting several times a year to discuss the real challenges and issues facing the academy as they individually seek to find ways to collaborate and break new ground in the fields of educational research. At a time when Black males continue to remain virtually invisible at predominantly White college campuses — both as students and faculty members — the success that these five academics (all under the age of 45) have achieved in a relatively short period of time is out of the ordinary. It’s no secret that higher education has become fiercely competitive. Yet these men write and edit together, convene symposiums together and spend countless hours mentoring other young Black males and females who are making their way through the academy and aspire to someday become university professors. At the same time, they’ve become productive scholars at their individual institutions, generating millions of dollars in research grants, contracts and gifts. “When you look at the literature as it is today, I’d like to think that we played a critical role in advancing knowledge about African-Americans throughout the educational pipeline,” says Moore, who currently works at The Ohio State University. He’s an associate provost, a distinguished professor of education and the director of the Todd Anthony Bell National Resource Center on the African American Male. Their work has often been cited by other scholars. Between the five of them, they’ve authored and edited 20 books, published 719 articles, delivered 852 presentations, won 95 awards and procured more than $48 million grants and contracts. By the late 1990s, there was a groundswell of attention focused on the trajectory of Black males in the academy. At the time, Dr. Lee Jones, who was the associate dean for academic affairs and instruction and associate professor of educational leadership and policy studies at Florida State University, produced an edited volume titled, Brothers of the Academy: Up and Coming Black Scholars Earning Our Way in Higher Education. “We kind of [had] heard of each other, but we had not necessarily met each other,” recalls Moore, who cites his participation in a meeting of the Brothers of the Academy as one of the first opportunities in which he realized there was a network of other Black male scholars who were seriously committed to rigorous research. What was attractive to each man about Brothers of the Academy is that each was studying and working at predominantly White institutions as lone academics, making the “synergy of coming together” even more powerful, says Lewis, who is the Carol Grotnes Belk Distinguished Professor of Urban Education at the University of North Carolina at Charlotte and the founding executive director of its Urban Education Collaborative, which is dedicated to disseminating research on the improvement of teaching and learning in urban schools. Even when the Academy eventually faded away, Flowers, Gilbert, Jackson, Lewis and Moore kept meeting on their own. “It’s helpful to have a group of accomplished scholars that you can work with and who can critique your work as well as encourage you to produce innovative and meaningful scholarship,” says Flowers, who is the Distinguished Professor of Educational Leadership in the Department of Leadership, Counselor Education, Human and Organizational Development and the executive director of the Charles H. Houston Center for the Study of the Black Experience in Education at Clemson University. Each of the five men’s individual journey to the profession is quite different. University, Moore turned to education and was later intrigued when he learned that Dr. John McFadden had been named the Benjamin E. Mays Distinguished Professor at the University of South Carolina, the first African-American scholar in the history of the school to be endowed with a professorship. “This was striking to me,” says Moore. “It was a paradigm shift for me. I said, ‘Wow, I want to carve out a scholarly career in which I am able to make a difference in my community and beyond.’” He went on to earn his doctorate from Virginia Tech. Jackson, who earned his bachelor’s degree from the University of Southern Mississippi, was the first in his family to attend college. Born in Ashburn, Ga., he became interested in higher education as a music major who played in the drum and bugle corps. While touring the country, he overheard one of his instructors tell someone that he was planning to return to graduate school to pursue a degree in higher education. Intrigued, Jackson began taking graduate courses during his senior year and eventually earned his master’s and doctorate from Iowa State University. A third-generation college student, Lewis’ grandfather was the first dean of education at Southern University, located in his hometown of Baton Rouge, La. When Lewis enrolled at Southern, his focus was on the marching band and he tried to steer away from education. Lewis majored in chemistry, but quickly changed his major to business education and education after a professor encouraged him. When he graduated from college, Lewis taught high school for four years, earning the Teacher of the Year Award for the State of Louisiana. But he was not finished yet. “I knew this wasn’t it for me,” Lewis recalls. He eventually enrolled at Colorado State University to complete his doctorate in educational leadership. Impressed by his work, the department at his alma mater offered him a tenure-track position. Growing up in Hamilton, Ohio, Gilbert — who holds the Presidential Endowed Chair in Computing and is the chair of the Human-Centered Computing Division in the School of Computing at Clemson University, where he directs the Human-Centered Computing Lab — was the first in his family to attend college. His interest in sci-fi movies propelled him to the sciences. The dean of the school offered some encouraging advice and urged Gilbert to think about becoming a professor. “It had never crossed my mind,” says Gilbert. “I had never seen a Black professor in this field. It was beyond my imagination.” He eventually received his Ph.D. in computer science from the University of Cincinnati. Flowers is a third-generation college student who enrolled at Virginia Commonwealth University as an accounting major. Born in Richmond, Va., he decided to become a professor after the dean of the business school at VCU offered Flowers the opportunity to do qualitative research with him. Later, Flowers received a master’s degree in industrial statistics from the University of South Carolina. “I’m a product of a caring and compassionate family,” says Flowers. One common interest the five men share is the plight of Black males in education. It’s become a personal issue for each one of them and an area where they’ve published together. As recently as last October, Jackson co-convened with Moore the second international colloquium on the topic at the University of the Virgin Islands. Even as their careers continue to soar and their schedules grow hectic, the men have vowed that the tradition of “tea time” will continue.